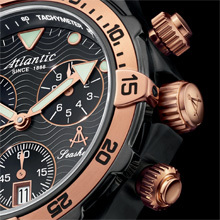 Flagship of Atlantic Watch, the represents an amalgam of the Brand’s complete know-how. Guaranteed water-resistant to 300 metres, it continues in a long tradition of marine watches, combining high watchmaking quality and sturdy character, like the 316L steel from which it is made. A windfall for lovers of strong emotions. This watch has a resolutely aquatic design and takes its name from the powerful marine animal, whose teeth appear integrated in the centre of the solid 316 L steel bracelet. Objective: determination, agility and force. A tough watch, the Blackshark is the proud heir of the Seashark line and offers an ultimate guarantee of precision, which all men of action are entitled to expect. Equipped with the ETA 251.272 Swiss Made movement, the Blackshark is the perfect partner, to be counted on in all winds and weathers. 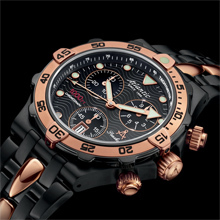 Screw-down crown for water-resistance, double thickness anti-reflection sapphire crystal, curved to resist pressure, hypoallergenic PVD anti-corrosion treatment on the case and bracelet, luminous Superluminova indexes and rotating bezel with 60-min scale for use by divers at depth, nothing has been left to chance. A reflection of the expectations of the high seas, the deep black dial has finely traced waves, accentuated by the 4 "aerofoil links" of the steel bracelet, which is equipped with a double closure system. Safety first! This explains the extremely clear legibility of the dial with the date at five o’clock. An effect further accentuated by the deliberate choice of the size of the hands, including a particularly striking sweep seconds hand. These new models will certainly attract attention too; in true Blackshark tradition!